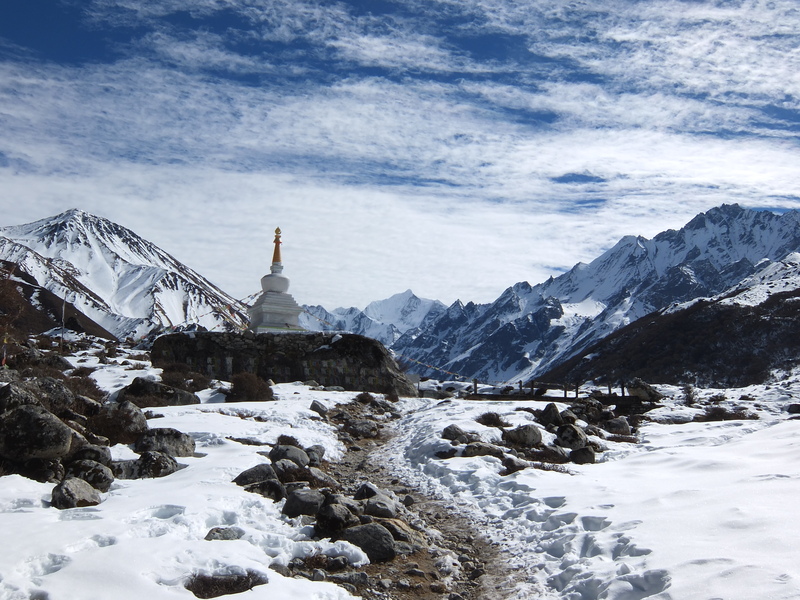 The snow-capped face of Langtang Lirung stares down at each weary trekker that passes by her cascading rock surface, which presides in the closest trekking region to Kathmandu, Langtang. Here you can enjoy the unfrequented passes that give but a glimpse into Tibet and partake on a pilgrimage travelled by Hindu and Buddhist devotees during a full-moon to the high altitude lakes; enjoy the heartfelt and warm company of Tamang peoples, and walk through gripping forest of thick pine and rhododendron that lead to an uninhabited cascading wilderness of fortifying mountains and snowy trails. 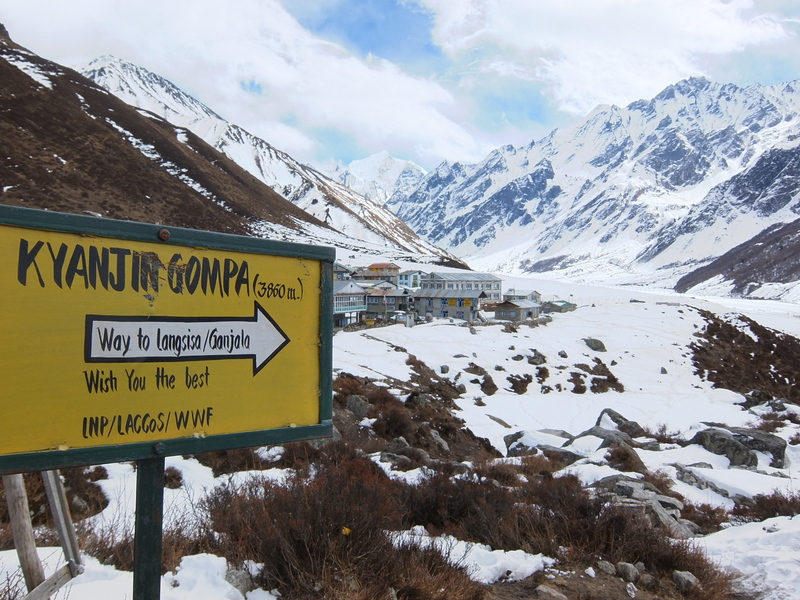 To simply complete the Langtang trek you don’t need any specialized camping or climbing equipment as it follows a route full of teahouses to accommodate any number of trekkers. 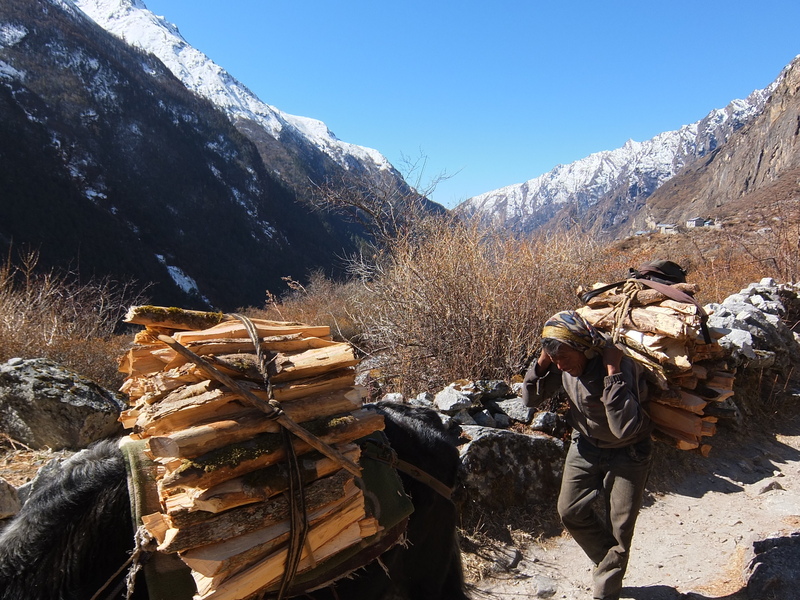 However, as with any trekking in Nepal it’s important to have the basic warm weather gear and a sufficient amount of cash at hand (plenty in small change) to make your journey more enjoyable. Goose down jacket, thermal liners, trekking pole, warm hat, gloves, good trekking shoes (boots or shoes, either is fine), shorts for the days, and proper polarized UV rated sunglasses and you should be laughing. I’d recommend about 10,000Nrp in cash (roughly $100USD) for the 4-5 day trek as you’ll be spending about 800-1200rp/day (based on low season), plus a small slush fund for emergencies. From Kathmandu catch the local “express” bus from tourist bus park for 500rp to the starting point in Syabrubesi. Although it’s only 120km from the city the ride takes about 9 hours as you whip around hairpin turns that curdles the blood in your veins if you venture to take a look out the window. There are three busses from the city, the last of which departs at 7:30am – affording you amazing views as the sunrise begins to engulf the city district by district. You`ll need to spend at least one night in this small town coated in guesthouses as you won`t arrive until about 2-4pm. 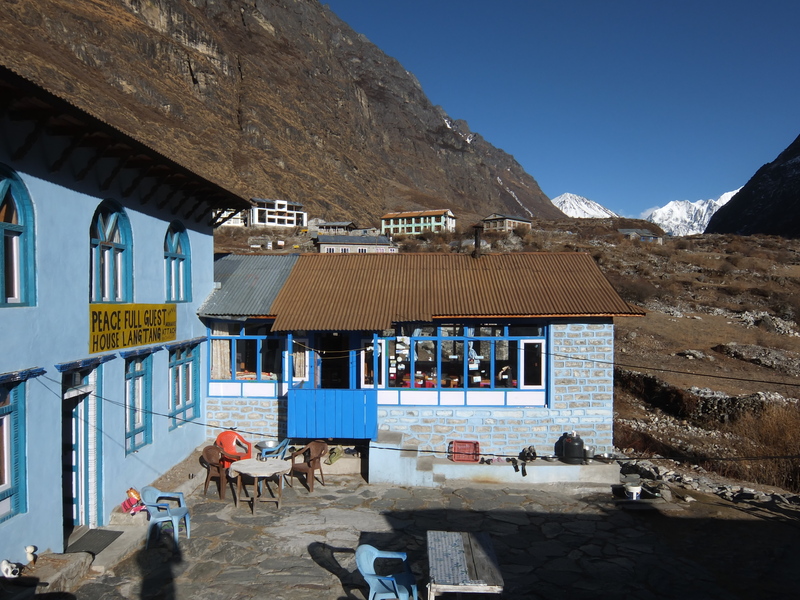 My recommendation is Tibet Guesthouse, which serves up a delicious plate of Dal Bhat for 230rp and provides you a warm bed for 100rp/night. 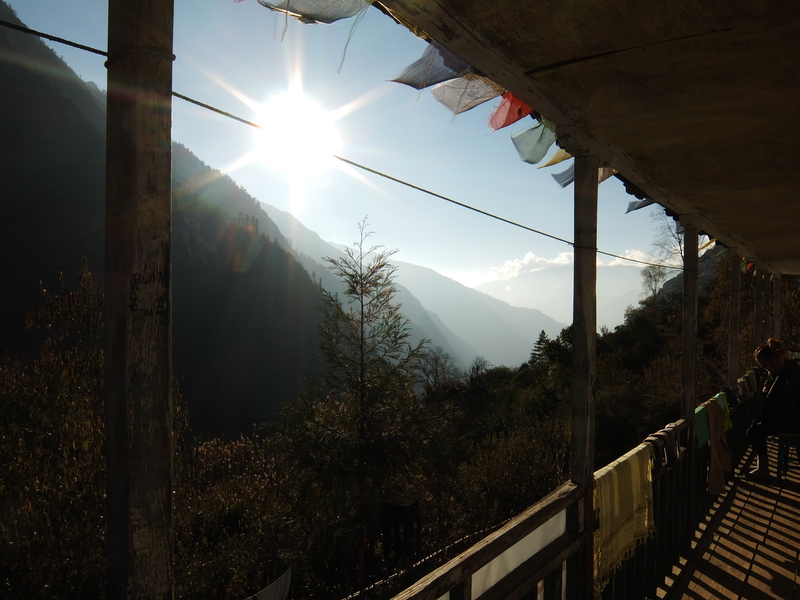 Although the popular option is to head to Lama Hotel (which is a village, not just a guesthouse) I’d recommend stopping 20-minutes earlier at Moonlight View Guesthouse before the trail descends into the Lama valley to allow yourself an extra 1.5 hours of sunlight and amazing views of a cascading valley. Moonlight View Guesthouse – Like every teahouse along the trail if you eat dinner (typically Dal Bhat) the accommodation is free. Dal Bhat typically goes for about 420rp and we bargained for 30% off the entire menu price (be aware this is low season). Waking up early isn’t always easy from Moonlight View as the sun doesn’t reach the middle of the valley until later in the morning. A quick bite of porridge and a masala tea and you’re ready to go. The first 3 hours is a fairly steep ascent until your reach the town of Ghoratabela (a great lunch stop) then the trail gains altitude gradually as you make your way through monkey filled plains for the remainder of the day. 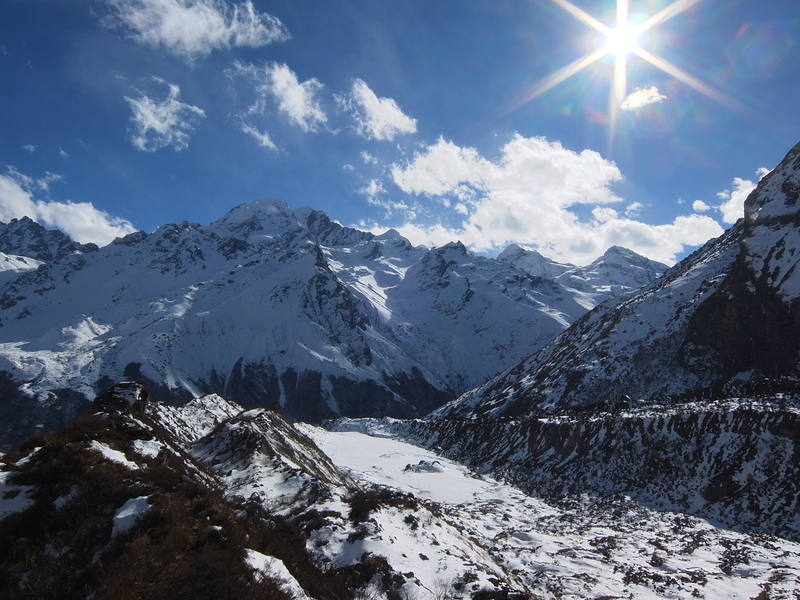 Once you reach Chyamki, Langtang seems but a stone’s throw away, however don’t be fooled for the traverse is another hour through a heavy breathing sky. 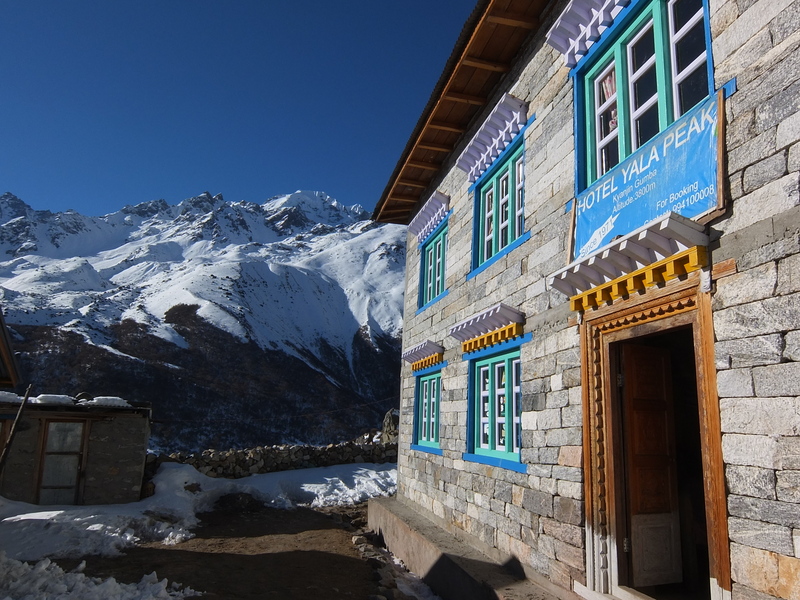 There are a ton of options for accommodation in Langtang, and a great base to see Kyangin Gumba for a day if you’re in a rush. We chose to stay at Hotel Peaceful simply because we’d met a local Tamang man along the way that decided to accompany us to his sisters place (mentioned above) and onward the next day to his guesthouse at Kyangin Gumba. 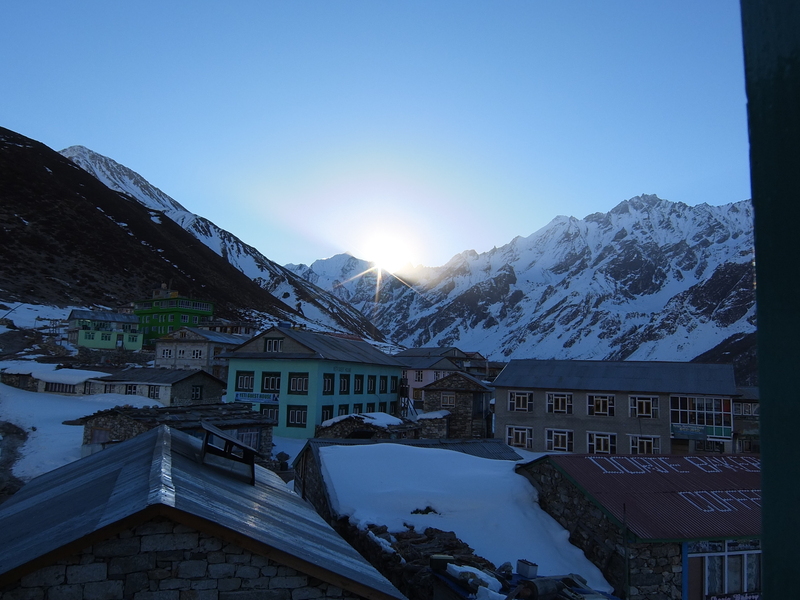 Waking up to a beautiful sunrise with a horizon blanketed by the cover of mountain giants isn’t such a difficult morning – knowing that you only have to trek a few more hours to reach the final town is even better! The trek is fairly gradual ascent the entire way with a few brief steeper inclines. It’s difficult to put into words, but after even a couple days of trekking you feel you are met with instant gratification towards the scenery around you. Massive Himalayan peaks create a coliseum-like effect as a clearly living sky breathes a life that the mountains clearly seem to inhale. Kyangin Gumba itself is actually completely bent on tourism as it’s fairly uninhabitable to sustain a local population and is a series of condensed 3-story building in a neat little area – although it sounds lacking in character is does have quite a cozy feel. With our unofficial “guide” we went to Yala Peak Guesthouse seeing as he’d walked with us a good chunk of the way. Yala Peak Guesthouse – We again received free accommodation plus an additional 30% off. This clean, cozy, and recently built guesthouse has spacious rooms with clear views of the surrounding mountains. Dal Baht costs 550rp and oatmeal is 320rp. I’d recommend spending at least two nights in Kyangin Gumba. 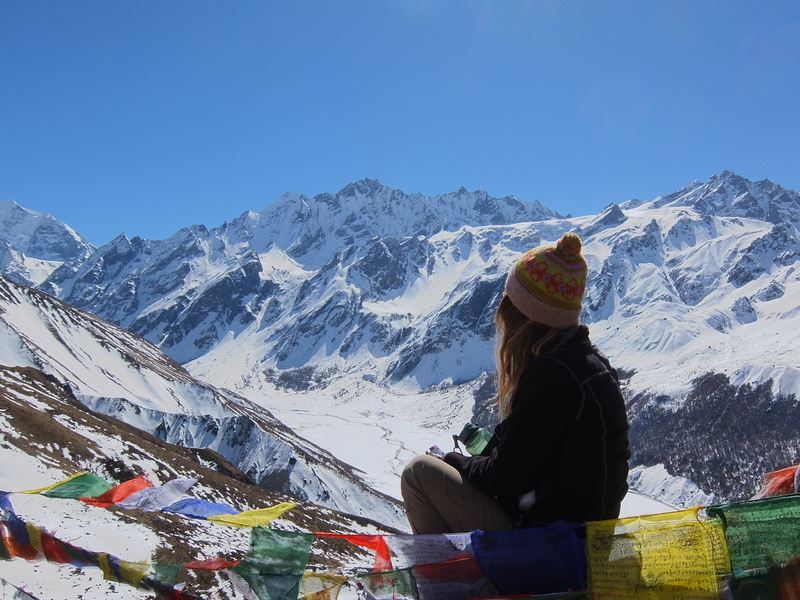 However, if you’re strapped for time you could leave early from Langtang and have enough time to eat a quick brick of cheese and climb to the lookout on Kyangin Ri. Kyangin Ri (4773m) – Is the easiest summit to conquer in the area. 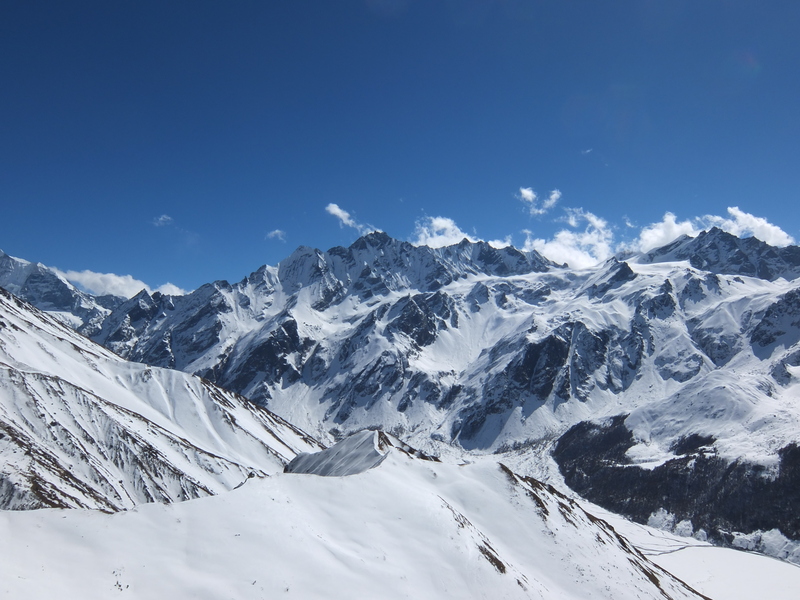 A steep ascent for about 1.5 hours takes you to a pristine view point that overlooks the entire Langtang Range. If you’re feeling a little gutsier you can trek along the ridge to the summit proper another 400m higher that affords even more astounding views. Be wary though, this extra 400m can get quite narrow and icy and a slip in the wrong direction is a first-class ticket to a bad time. Depending on your fitness level and the strength of your knees it is possible to make an even farther descent, but we found the two day trip calm, enjoyable, and easier on the legs! 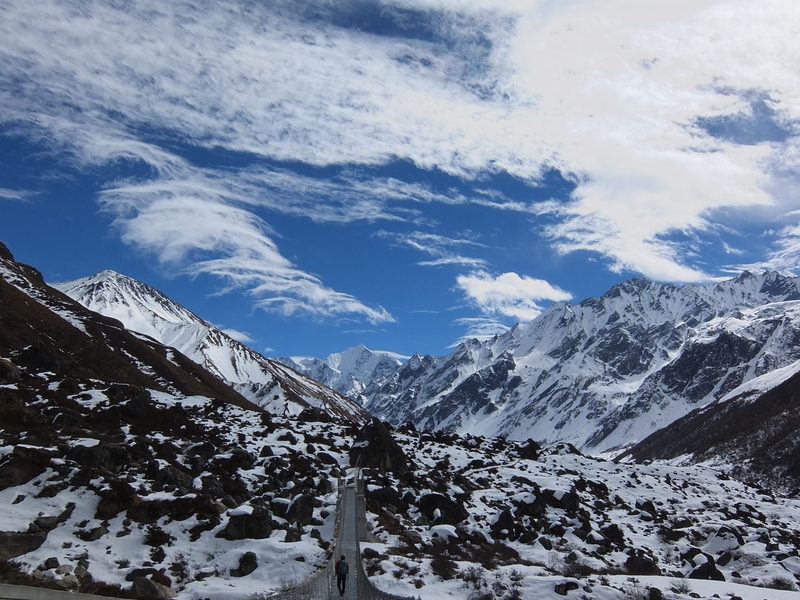 The way back is simply everything in reverse, besides skipping out on Langtang village the second time around. You’re still quite high from the altitude and stark scenery all around that this descent feels like a breeze, and you really can’t believe how far you’d come. After the descent you’ll find yourself back in ‘Besi’ where you can wash up, do some laundry and continue on to do the Tamang Heritage Trail or Goisunkund (see “Trekking in Nepal – Tamang Heritage Trail” for more information of either route, as well as looping options) or simply get a goods nights rest at Hotel Tibet and grab an early bus back to the wild Kathmandu. You’re complaining about your pack?